This unit typically will NOT replace a jalousie unit installed in an older model wood primary door. Spring loaded jalousie clips hold glass tight. Clear or Obscure glass available in either annealed or optional tempered. Worm gear operator locks in any position. Worm gear operator is installed on the right side jamb inside looking out. Left side is available upon request. 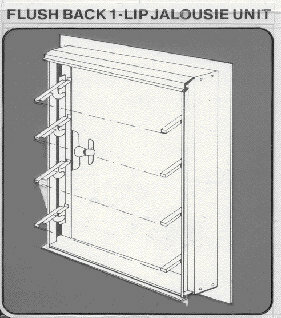 At height 62", jalousie windows come built with double operators located in the center. Special expanders available to fit any opening.